•Participants can walk, run or ride their bikes; there will also be a fair complete with carnival games and raffles; the money raised will go to the Punta de Mita Sports Community Center. 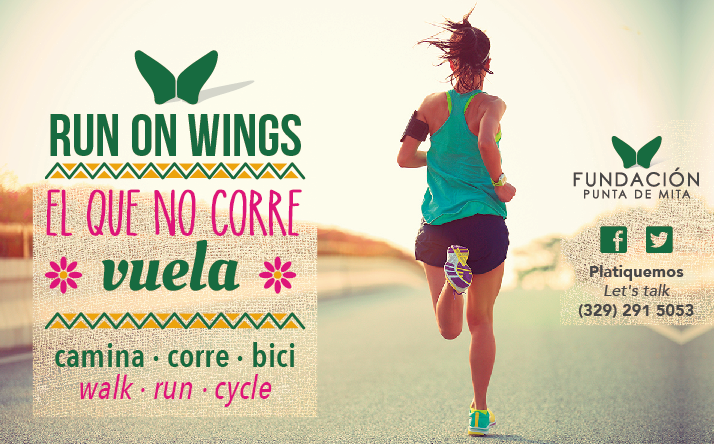 The Punta de Mita Foundation is extending an open invitation for the general public to attend the “Run on Wings” 5K that will take place next Sunday, March 26, 2017, around 7 a.m. on the road from Higuera Blanca (Litibú) to Punta de Mita. This is a fun run for families and friends to enjoy time together. The expected contribution is $150 pesos per person and the first 100 people who register will receive a commemorative t-shirt. Every penny raised will be in pro of the Punta de Mita Community Sports Center, the site of the post-race fair. Participants can walk, run or ride their bikes; there will also be a fair with carnival games and raffles with different items on the table, among them, Stand Up Paddle classes, a fishing trip, a child’s bicycle, electronic tablets, a massage certificate and more. For registration and more details visit: http://fundacionpuntademita.org/carrera-5km-punta-de-mita-feria/.